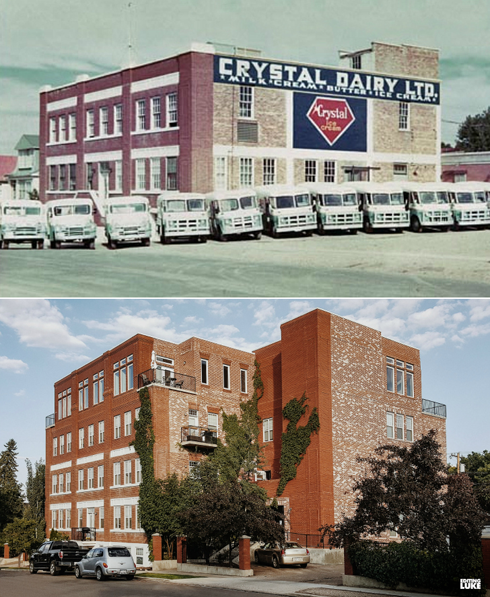 Trucks lined up outside of the Crystal Dairy in 1955 are contrasted against the modern day apartment building in 2017. Elephants parade down 2nd Street in downtown Medicine Hat advertising the arrival of the circus in 1920. 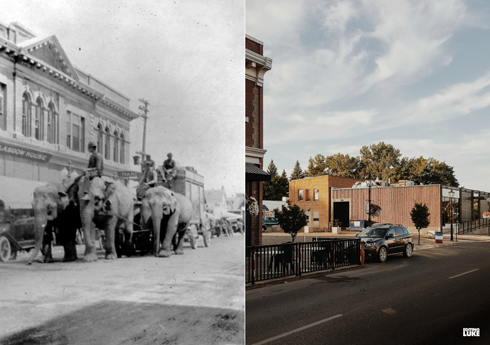 While part of the building in the background has since burnt down, in 2017 these elephants would be about to walk by Station Coffee Company. 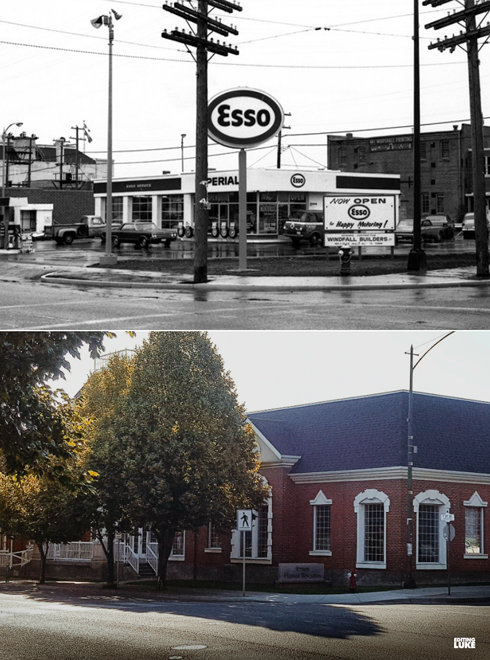 A brand new Esso in 1966 meets modern office space in 2017. This is the corner of 1st Street and 5th Ave. The fire hydrant is still in the same place. 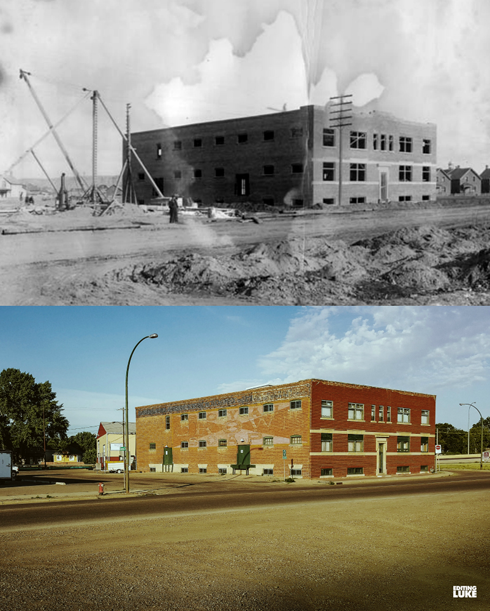 While education has changed a lot between 1929 and 2017, the biggest difference to Elm Street School is actually barely visible in this archival image. Notice a few more windows peeking out from behind the school in 1929? Elm Street School originally had a giant rear wing that was later demolished in 1973. Seen here in 1939, King George VI (on the right) and Queen Elizabeth arrive at the train station in Medicine Hat on their cross country tour of Canada. 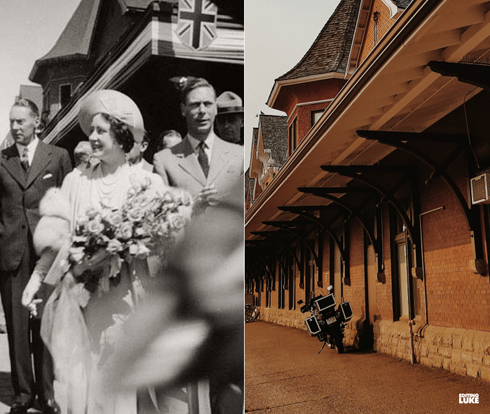 Leading up to the outbreak of WWII, the unprecedented scope of the visit saw the royals visit each Canadian province, traveling much of the country by rail. Thousands upon thousands of spectators greeted the royals in each of the numerous communities and stops along the way. The tour was meant to emphasize the Dominion of Canada's independence from Britain, while also rallying support in the event of war. It marked the first time a reigning British monarch had visited Canada, and as such, the visit proved to be a huge morale booster for the country. 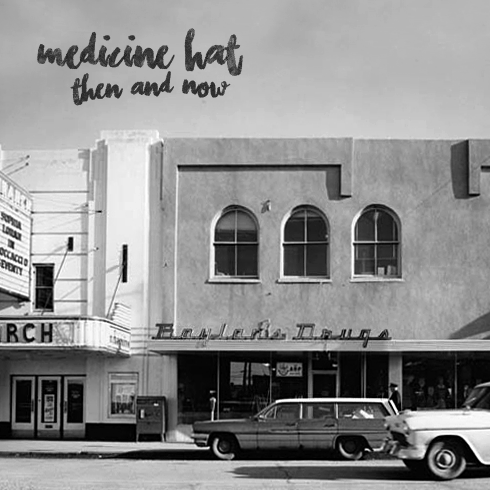 Medicine Hat's train station is easily recognizable in the background of this archival photograph, and the exterior still looks very much the same in 2017. 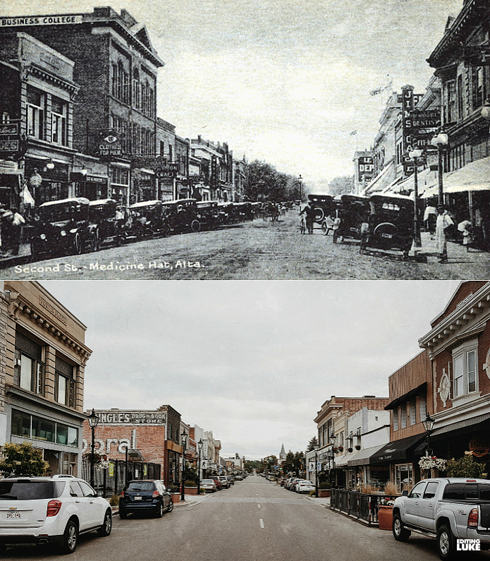 Lots of changes, but also lots of similarities along 2nd Street between the 1920s and 2017. 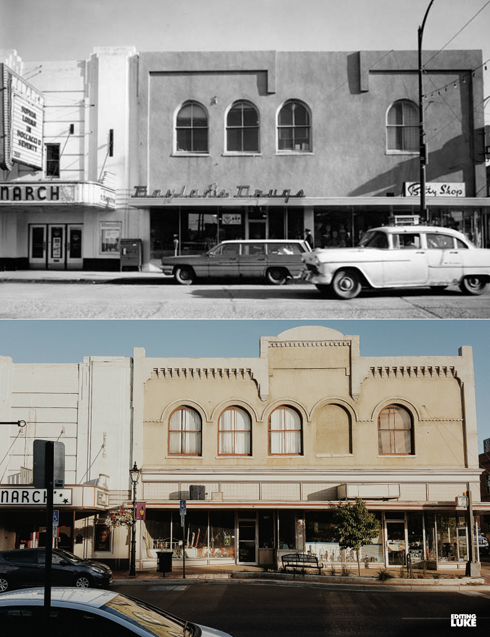 What's particularly interesting about the 1962 image is that the corner building is seen with a renovated mid-century facade. 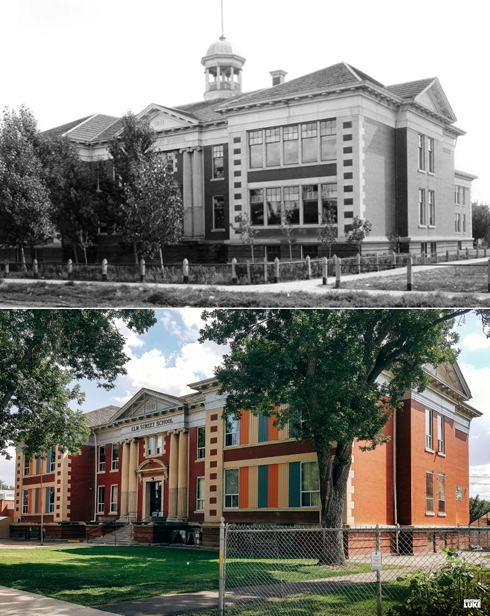 By contrast, the same building in 2017 was clearly refurbished at some point after 1962 to look like it originally did when it was constructed in the early 1900s. 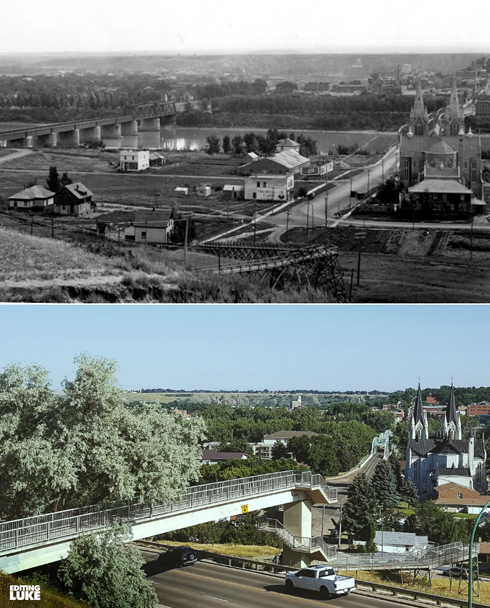 Once again one of the defining differences between Medicine Hat nearly a century ago and Medicine Hat today - TREES! Seen here during construction in 1913, this rail yard warehouse is often remembered for housing the Dominion Fruit Company / Dominion Grocers. The building still stands today and looks very much the same, however I'd be really curious to see the inside.